Launched in November 2016, the Okinawa Environmental Justice Project strives to protect the environment and the lives of people in Okinawa, Japan through the means of "connecting the green dots." That is, we reach out to, connect, and make best use of available resources in local communities, environment NGOs, domestic institutions and laws, and international institutions and conventions in bringing environmental justice to Okinawa. We believe that, by protecting the environment, we can also improve the quality of life and promote peace/genuine security in Okinawa and beyond. As our first action, we, along with 38 other Okinawan and Japanese organizations, are sending a letter of concern and request to the U.S. government and the U.S. military regarding the future of the Yanbaru forest in northern Okinawa Island. Can the Yanbaru forest become a World Natural Heritage site? Or would the presence of the U.S. military's Northern Training Area in the Yanbaru forest, low altitude flight training, and the construction of new landing zones hinder the forest's chance of becoming a World Heritage Site? Would the U.S. military and the U.S. government make sure that the Yanbaru forest become a World Heritage site? These are some of the concerns and reqeusts expressed in the letter. Please read our letter and help spread the word. *PDF versions of the letter (without photos) and the map are also available for download at the very bottom of this blog page. 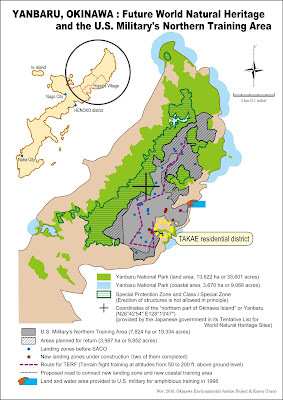 We write to express our concern and to make requests to you regarding the construction of six “landing zones” for U.S. military aircraft in the U.S. military’s Northern Training Area (NTA) in the Yanbaru forest in northern Okinawa Island, especially in light of the fact that the Yanbaru forest is now on the Tentative List submitted by the Japanese government for UNESCO World Natural Heritage Sites. As the U.S. Forces in Japan is well aware, the Okinawa Defense Bureau is now rushing to construct all the proposed landing zones by the end of the year 2016 amidst strong opposition from local communities and global environmental and peace organizations. To do so, the Bureau adheres to its 10-year-old Environmental Impact Assessment (EIA) (2007) for the construction, despite the fact that that EIA has been widely criticized for its scientific and procedural flaws. The Bureau is also making drastic changes in construction procedures while failing to implement mitigation measures set forth in the EIA. This was most apparent in the revelation in October 2016 that the Bureau plans to clear-cut over 24,000 trees for construction of landing zones and entrance roads. Not only is the Bureau destroying the environment, but also it is subverting the integrity of EIA. Intense and violent confrontation between protesters against the construction of landing zones and the riot police force dispatched by the Japanese government takes place daily at the construction sites. It often leads to various human rights violations, including unwarranted arrest and detention of protesters, in some cases causing injuries, and the use by police of derogatory terms such as “Dojin” (a discriminatory term referring to indigenous people). The situation is chaotic and dangerous, escalating further the already antagonistic relationship between Okinawa and the Japanese government. The opposition to the construction comes from various quarters. The residents of Takae in Higashi village have been opposing it since late 1990s because these landing zones are built extremely close to their community. The aircraft training, using the two completed landing zones, is already causing intolerable levels of noise, disrupting and threatening their daily life. Others oppose it because they see the new landing zones as another form of military burden imposed upon Okinawa by the Japanese government. Okinawa, only 0.6% of the landmass of Japan, already bears the “hosting” of 74% of the U.S. military bases and facilities in Japan. Still others (including the authors of this letter) oppose it because the landing zones are being constructed within a sensitive area of the Yanbaru forest, which is one of the most important ecological areas in Japan as discussed below. We are concerned that, despite all of this, the U.S. military and the U.S. government have remained silent, allowing construction, destruction, and confrontation to take place as if you had nothing to do with these matters. We understand that the construction of the landing zones is one of the conditions agreed between the U.S. and Japanese governments for the return of a half of the NTA to Okinawa in the Special Action Committee on Okinawa (SACO) agreement in 1996. We also understand that, under the Japanese and U.S. Mutual Security Treaty and the U.S. and Japan Status of Forces Agreement (SOFA), the Japanese government is responsible for providing facilities and areas to the U.S. military, and thus the Japanese government is accountable for the construction of those landing zones. 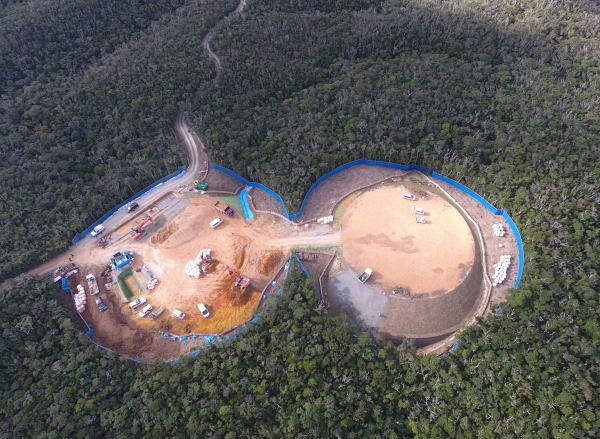 In other words, the U.S. government and the U.S. military have the power to make decisions over whether or not to allow the construction of landing zones in the NTA. We now direct your attention to the fact that the Yanbaru forest is on the Tentative List submitted by the Japanese government for UNESCO World Natural Heritage Sites. As the U.S. Forces in Japan is well aware, the 27,800 ha (68,695 acres) Yanbaru forest is the oldest subtropical rain forest on Okinawa Island and it is one of the richest biodiversity areas in Japan. It is home to some 5,400 species of fauna and over 1,000 species of vascular plants. They include over 170 endangered species listed on the Red List of the Japanese Ministry of the Environment. Endemic and endangered species such as the Okinawa woodpecker (Sapheopipo Noguchii) and the Okinawa rail (Rallus okinawae) are the best known of the well-known habitants of the Yanbaru forest. They are also Japan’s “Natural Monuments.” It is most appropriate that the Yanbaru forest, along with Iriomote Island also in Okinawa prefecture, and Amami-Oshima and Tokunoshima Islands of Kagoshima prefecture will be officially considered for inscription on the UNESCO World Heritage List. The Japanese Ministry of the Environment, the Okinawa prefectural government, other governmental agencies, and local communities worked hard to get the precious environment of the Yanbaru forest on the Tentative List in February 2016. The Environment Ministry also designated in September 2016 a central part of the Yanbaru forest as Japan’s 33rd National Park as part of the World Natural Heritage inscription process. It is expected that precise boundaries including “buffer zones” for the Yanbaru forest for World Natural Heritage will be established soon and that the International Union for Conservation of Nature (IUCN), the expert advisory body for UNESCO, will visit Okinawa to evaluate these sites sometime during 2017. 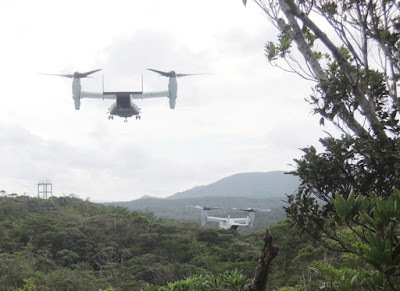 Meanwhile, since 1957, when 7,800 ha (19,274 acres) of the Yanbaru forest was taken over by the U.S. military and converted into the U.S. military’s Northern Training Area, the U.S. military has been conducting jungle warfare training and low flying training of aircraft there. There are 22 (plus 2 newly constructed) landing zones for military aircraft and other training facilities in the NTA. Loud noise emitted from aircraft, land contamination from disposed materials and crashed aircraft, combined with logging and construction of logging roads by local forest industry, have presented and continue to present significant environmental challenges to the Yanbaru forest. The current construction of landing zones now adds to those challenges. Regrettably, there is no evidence that the U.S. military has given proper consideration to this World Natural Heritage inscription process of the Yanbaru forest. None of the U.S. military’s documents available to the Okinawa public acknowledges the inscription process. One example is the U.S. military’s “Final Environmental Review for Basing MV-22 at MCAS Futenma and Operating in Japan” (the so-called “Environmental Review”) prepared by the U.S. Navy for the deployment and training of MV-22 Osprey to Okinawa. The Environmental Review discussed the natural and cultural resources of the Yanbaru forest and laws and regulations to protect them. However, it completely failed to address the fact that the Japanese Ministry of the Environment and the Okinawa prefectural government were engaging in preparation for the inscription process despite the fact that their preparation was in 2012 (when the Environmental Review was published) already well underway. Given that the U.S. military closely follows developments in Okinawa in general, especially ones associated with the U.S. bases, facilities and areas, we have difficulty understanding why this is so. We do not know whether the U.S. military ignores information on the inscription process or the Japanese government has not properly informed the U.S. military of it. We are concerned that, the U.S. military and the U.S. government’s failure to acknowledge the World Natural Heritage inscription process, along with the construction of the landing zones, the violent confrontation and human rights violations and the training of U.S. military aircraft, all hinder the inscription process. Wherever possible, transboundary nominations should be prepared and submitted by States Parties jointly in conformity with Article 11.3 of the Convention. It is highly recommended that the States Parties concerned establish a joint management committee or similar body to oversee the management of the whole of a transboundary property. The inclusion of a property in the World Heritage List requires the consent of the state concerned. The inclusion of a property situated in a territory, sovereignty or jurisdiction over which is claimed by more than one State, shall in no way prejudice the rights of the parties to the dispute. 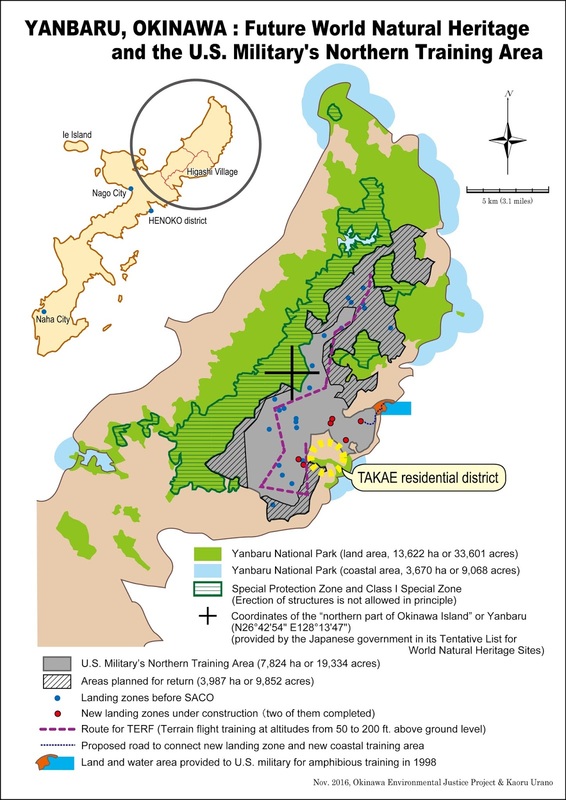 Please be reminded that the U.S. military’s NTA, over which the U.S. has jurisdiction, is located in a sensitive part of the Yanbaru forest and that the coordinates of the “northern part of Okinawa Island” or the Yanbaru forest for World Natural Heritage inscription provided on the Tentative List is just 1 km (0.6 miles) away from the NTA. We do not believe that the U.S. military and the U.S. government would like to be seen as an obstacle in the way of the World Heritage inscription process in an ally country. That relevant U.S. government agencies, including the Advisory Council on Historical Preservation and the Office of the Assistant Secretary of Fish and Wildlife and Parks, should be involved in the assessment process. The following organizations support this letter. 「画像ウィンドウ」テーマ. テーマ画像の作成者: Galeries さん. Powered by Blogger.